Here’s a story about a dad. And a tree. It’s about a battle that went on for two days. I play disc golf every day. Rain or shine. Mud or drought. I’ve canned shots from 45 yards, through a gauntlet of branches. I’ve missed putts from distances so short I could have peed on the disc catcher. I’ve ripped up a course one day, flung a disc in the lake the next. I play to clear my mind. I play to get vitamin D out in the sun. I play to exert myself and problem-solve among the oaks and woodpeckers. And around the stoners and nature-center-play-date moms. Noise has invaded my game. With noise between your ears, your throws disrupt nests and stream beds. I gritted my teeth through cable-TV-worthy curse words and looked to the heavens for answers on a bad day. And that’s when I saw it – a red disc, wedged high in a tree. A free disc. 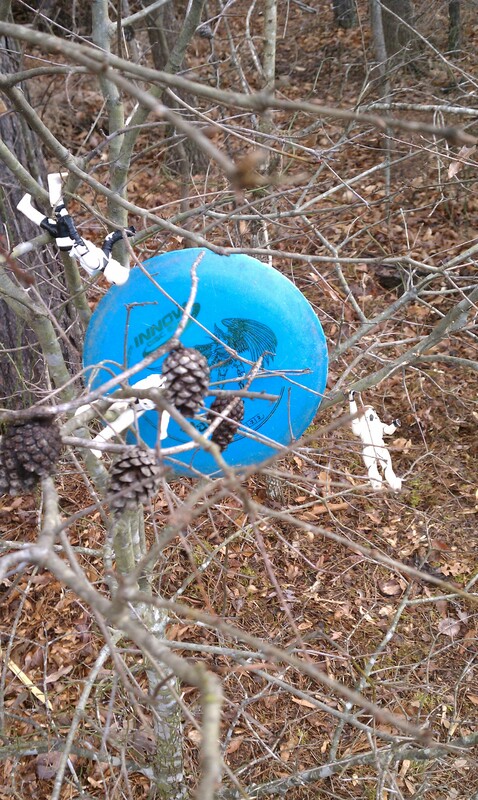 Nothing can turn around a bad week of disc golf like adding someone else’s disc to your bag. I took aim with a blue disc, a Valkyrie that Elise uses. I came thisclose. The Valkyrie stuck in the branches with the red disc. Now, I had two discs to rescue. 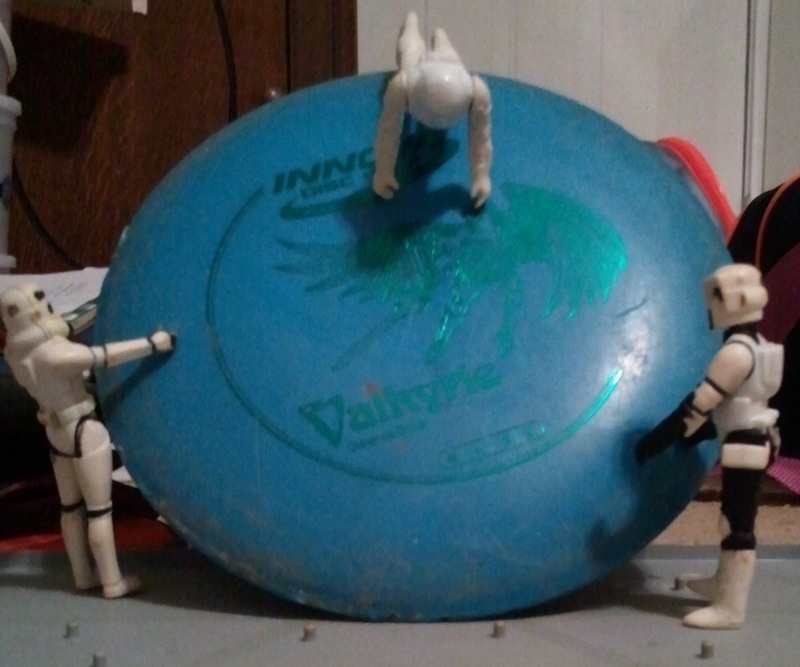 That disc got stuck, too. Both my discs were up there, with some downtrodden teenager’s. Time to go home? Not for a dad, it’s not. Not for this dad, especially. We dads try and fix a lawnmower by hitting hit, harder.We won’t give up on opening that bottle of nail polish for you, even at the expense of a hernia. We’re about turf battles and hard-headedness. That irrational resolve came into play. It’s dad drive, or dummy drive. You can’t tell which it is until it’s all over. I rummaged through the trunk. Jumper cables. Dress socks. Soccer balls. I stomped back toward my arbor nemesis, and chucked the size 3 baby blue ball at the ransomed discs. Branches flew. Mud splattered. The orange disc fell. Yes! Remember those trees that lunged at and molested Snow White? This was such a tree. It wrapped its knobby arms around that undersized football and flexed its muscles at me. 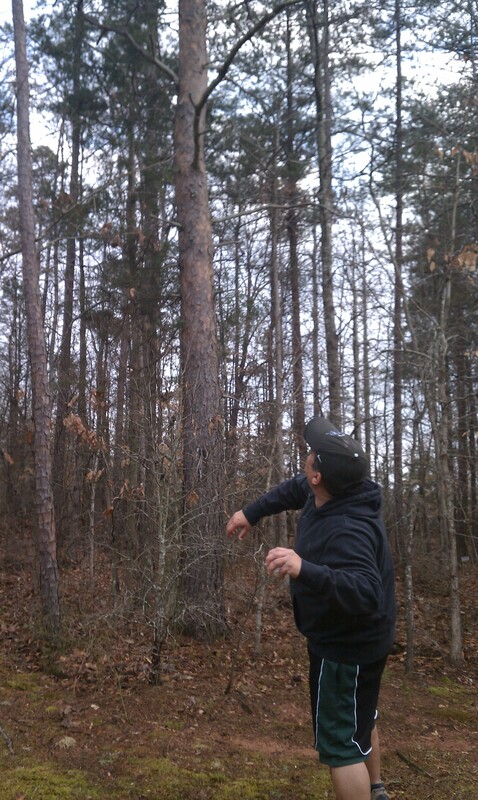 Evil tree 3, Dad 1. It was time to go. Or was it? I stewed a little overnight. Louisville Sluggers? Made of wood. So are my cutting boards. Even those fancy q-tips we once had. No idea where those came from. Definitely not the dollar store. I told the girls what happened. “I love that disc!” Elise complained. “I love that soccer ball!” Grace added. The next day, I stopped at Walmart for my weapon of choice: A baseball. The $1.77 variety. I wanted to prove I could vanquish my rooted rival with the lowest-brow baseball Wal-mart offered. (And I wanted to leave enough in the checking account for a victory burrito at Taco Bell afterward). I imagined a stiff breeze had freed my soccer ball overnight. It fell at the feet of an immigrant boy from Bangladesh who would get naturalized and become a savior for USA Soccer. I can live with that. I took aim and fired. And missed. To chuck most of his possessions up a tree will do that to a man. I now appreciate my Colorado Rockies’ inability to hit the cutoff man all the time. I now appreciate David’s view against Goliath. And how Tom Cruise looked silly next to Katie Holmes. Then my eyes narrowed. My resolve galvanized. And I let ‘er rip one more time. Trees are majestic. They provide shelter for God’s wee creatures. Shade for my people during their landscaping lunch breaks. They’re whittled and splintered to give us popsicle sticks. A tree represents Stanford University athletics. Awkwardly, but yes. But a tree can’t stand between a dad and his discs. Can a dad’s resolve change the world? Maybe. Can it help him retrieve what’s his, and also things that aren’t? Definitely. 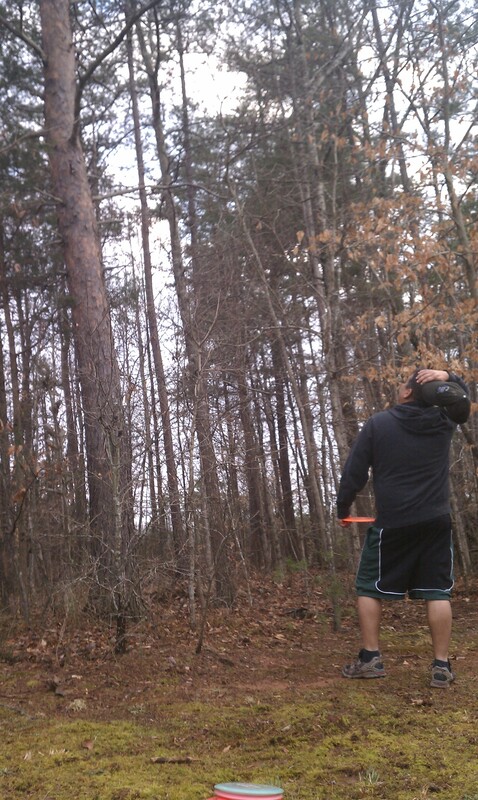 The strike I fired to free both discs at once sailed unscathed through all branches. The tree seemed to bow in reverence and graceful defeat as the discs plopped to the mud at my feet. I tipped my Rockies cap, and gave her a loving pat on the trunk. This was a story about a dad. And a tree. And a look at what might seem to be jackassery from cars passing by. But, mainly it’s about a dad. LOL I had to laugh, but you did it! If anyone saw me, they’d have laughed, too. Great story 🙂 Have a beautiful week!!! Mate, if that’s your approach to life as well, then you are doing okay. I would have come back with my chain saw. Foolish persistence – it’s the name of my game. It was a fair fight without the chainsaw, because she could fling a branch down on my head if she wanted to. Hmm, I didn’t think about falling branches. As I told Laurie, it’s often foolish persistence, but where there’s a will … there’s a good story if you fail, at least. Thanks for sharing it! She was a worthy opponent, and very proud. This epic tale has inspired and equipped me to meet the week’s obstacles with persistence, ingenuity, and grace. Thank you, Dad. Thank you, Tree. I’m honored – it was just one dude and one tree, but while I was in it, it definitely felt like something bigger to me. Thank you, Ann. Thanks Janine! I’m just glad a mockingbird hadn’t taken up residence there … or my eyes might have gotten pecked out. There are dads out there training for triathlons and cooking soup for the homeless, though. 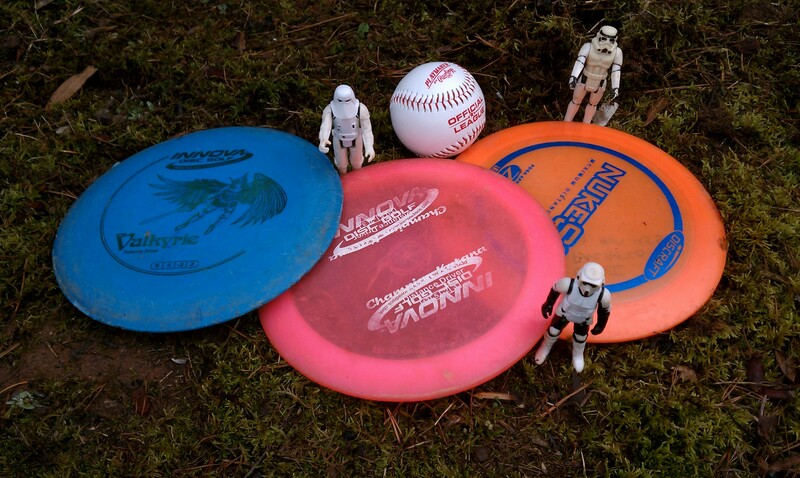 I just have a fun story to tell and kids to take pictures of my Star Wars figures and commandeered golf discs! I knew this was going to have a good ending (minus the soccer ball but….)!!! I have witnessed a similar situation more than once in my own backyard. It is amazing how many items boys/men are willing to risk to prove a point!!! Thanks for the vote of confidence, Kim! It goes back to the question, why did the man climb the mountain? Because it was there. I knew you’d do it! The stormtroopers knew too! And wait, how did you get those photos with them in there? Thanks Tamara. 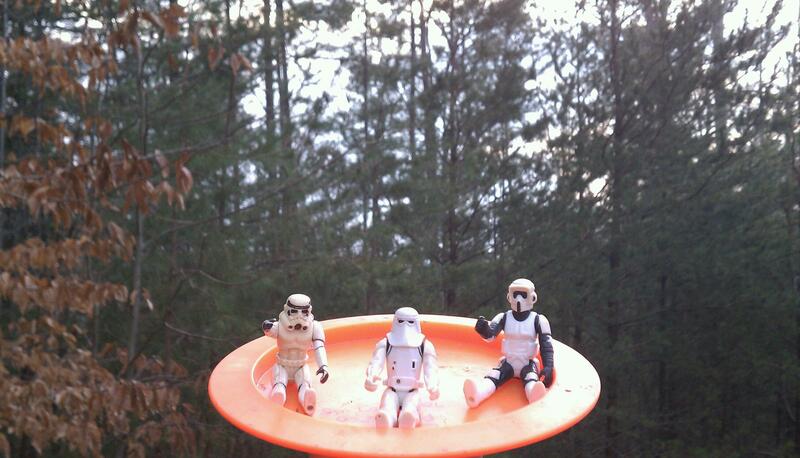 The stormtroopers thought they were on Endor for those shots! (The girls and I recreated the tree scene for photographic representation). I love this, I could so see my own dad or husband doing the same thing!! Congratulations! Thanks Kathy – we just don’t like to give up, and situations like this bring out our innovative side. Sometimes, you have to call time out and make a new plan. Thanks Jenn – I wonder if I’d gotten a not-so-favorite disc stuck, if I’d have done the same. It was my Mexican heritage that made me think it was a good idea to go after the ‘free’ disc in the first place! Dude – seriously, you need to come up here for the Lumber Jack Games and try some Tree Climbing. I promise you, it’s a thing. I think the record is somewhere around 13 seconds, but don’t quote me. The lowest branches were still too high for a 5-6 guy like me. Plus, a lumberjack might have just taken the tree down, right? I should have kept track on how many total throws it took to win. The recipe for persistence calls for a cup and a half of stubbornness, you know. 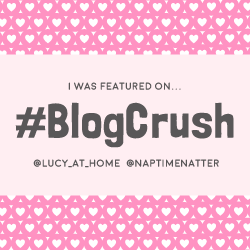 haha – great story! My husband would have kept at it too. He once looked for our daughter’s soccer ball in a field of tall weeds for over an hour. He never did find the darn thing, and he was so mad because it was a brand new ball…I had to convince him to give it up (plus I was getting tired of looking). If he’d been on his own, he would have come back with it 5 hours later. Thanks Michelle! Maybe it’s that male trait that leads us to hot-dog eating contests, arm-wrestling challenges and the desire to have the biggest gas grill on the block. Of course, the same juice probably powers us to pursue our mates. Giving up seems so – unmanly. I’d have done the same thing with the soccer ball. It has to be there somewhere. As long as there’s daylight .. and well, after that, there’s flashlights. Always a plan. My husband would have done the same thing! ‘No tree will defeat me’! I can see it all very, very clearly. A really great story….good job, Dad! Dude unite! We’ve been battling nature since we wore woolly mammoth boxer briefs. I’m just proud to follow my cro magnon brethren! Thanks Sandy. I truly wish there were a video of this story! Maybe you could re-create it and film it. And maybe the guy who lost the disc is who has your ball. My theory is that he came back while you were gone and that’s all he managed to rescue! It would have needed a censor beeper that probably would have fried out. I forgot to mention all the F-bombs that flew in the forest. Maybe you’re right about the cat who got my ball – and he’s probably written a blog about it, too. And to think, I left nothing in the tree for the next bloke. That’s about the same amount of stubbornness that I would have and just as many swear words! Too funny. Well, at least you got what you originally came for. LOL! That little boy from Bangladesh thanks you! Swear words fuel the soul in those situations, don’t they? Those discs were coming down – if it was the last thing I ever did on this earth. I lost a soccer ball, but gained a disc. That’s like a win. Oh, and in 10 years, when the U.S. wins the World Cup with my little Bangladeshi warrior, the cycle will be complete. Pingback: 3 Movie Dads I'd Share a Pizza With for Father’s Day - What The Flicka?